Many of us are leaving for the North American Hand Built Bike Show tomorrow morning. So the VO showroom will be closed Thursday and Friday. Orders will continue to be shipped without delay by our ever-industrious warehouse staff. Now that you've seen the Grand Cru crank, I thought you might be interested in the less expensive VO models. These are all 110bcd, JIS taper, 5-10 speed compatible, and fairly modern in design. Note that the logos on these prototypes will be replaced with a VO crest. Also, there are a few extra little holes in the prototype chain rings that won't appear on the production version. This first crank is our wide range Polyvalent crank. It has 46/30 rings and comes with a high polish alloy chain ring guard. Weight is 770g and q-factor is 158mm. The 46t ring is specially designed to shift properly in the middle position. A regular 46 outer ring won't work properly because it's spaced for outer position mounting. We're shooting for a price of around $100 for this model. These are already on order. The triple has 48/38/28 rings, weighs 740g, and has a q-factor of 164mm. 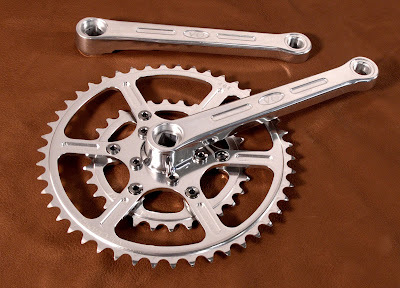 The finish is high polish as on the above crank. We may upgrade to super durable CNC-cut 7051-alloy rings similar to what's on the Alpina crank, but with an even nicer finish. The price will probably be around $130 with the upgraded rings. This is the 48/34 double. It weighs about 675g and has a q-factor of 158mm. 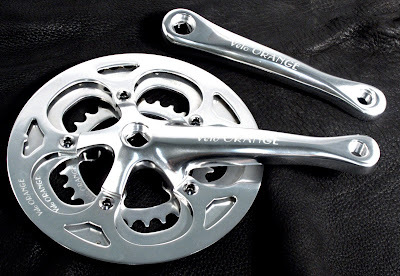 You'll notice that this crank is wicked shiny; it's chrome plated aluminum. The finish looks great and everyone who has seen it absolutely loves it. But, to be honest, we are not sure how well it will wear, so we probably won't use it on the initial production run. If it holds up in testing we'll introduce it later. As with the triple, we may upgrade the rings. Price should be around $120. Individual chain rings in various sizes will also be available separately. 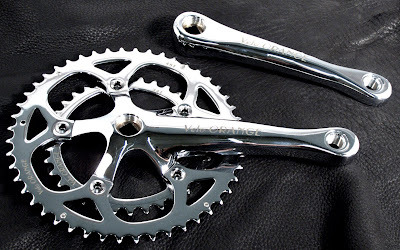 Our goal here was to come up with good looking cold forged cranks that were reasonably priced, but with chain rings and hardware as durable as the best cranks made. How did we do? The VO Rando frames arrived today. They look great and we did quality control checks this morning and were very pleased. We're building up samples right now. You may remember that we changed paint color from the prototype's silver to dark blue. The paint job is very nice, not as good as custom paint, but better than many production frames. The blue color has a little red in it so there is a purple tint, all in all we think it's rather handsome. The frames can be now be ordered on the site. Any part ordered with the frames are discounted by 10%. The VO Rando racks, which fit this frame, also arrived. There were several previous posts posts about this frame. Photos of, and commentary about, the prototype can be found here. 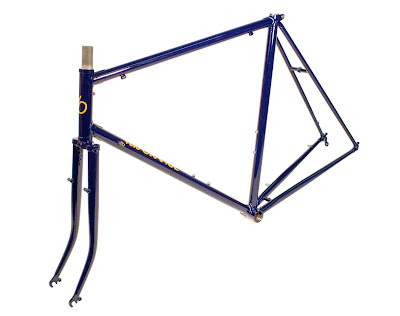 This frame is basically a production version of our, now discontinued, custom randonneur frame. It has taken almost three years to get these frames made, but once you see and ride them we hope you'll agree that they were worth the wait. 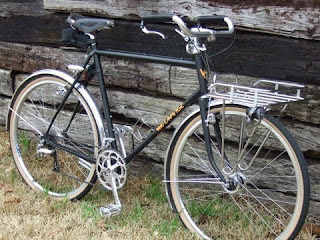 The Velo Orange Rando frame is designed for spirited long distance road riding and light touring. It can be thought of as a frame that's halfway between a racing frame and a touring frame, suitable for a “credit-card tour”, a 1200km brevet, or a fast club ride. Construction is lugged and of traditional diameter, not oversize, double butted chrome-molly tubing. The lugs are classic medium point style with small reinforcement webs. 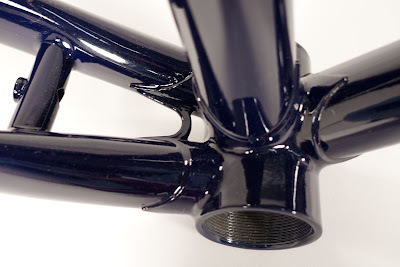 Tubing specs and geometry are virtually identical to those used on our semi-custom Pass Hunter and Rando frames. The frame is designed to give a supple and comfortable ride. The paint is dark blue with just a bit of red, giving a slight purple tint. 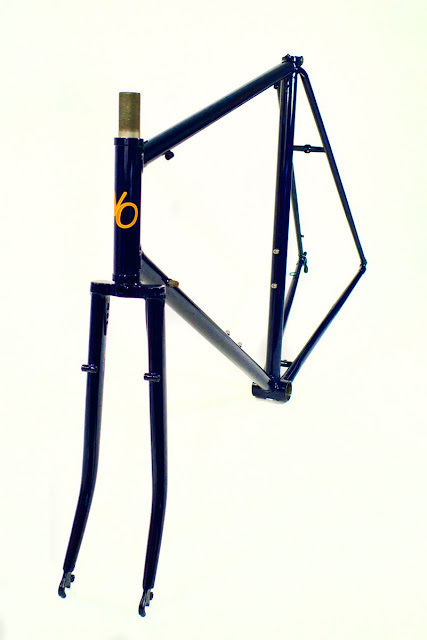 A single decal graces the downtube, in the traditional constructeur style. The rando frame is designed for long reach (47 to 57mm) caliper brakes. The ideal tires for this frame would be high quality supple 25-30mm 700c tires such as Pasela 28mm, Grand Bois 28mm, or Challenge 27mm (which are really 29mm). Such tires will provide optimal handling, a very comfortable ride and low rolling resistance 43-45mm fenders fit perfectly. Maximum tire size without fenders is 32mm. As with all VO frames the emphasis is on comfort and perfect handling, handling that is neutral and forgiving even after 12 hours in the saddle. We use a low trail design as perfected by the French constructeurs and famed for it's ability to "take care of a tired rider". 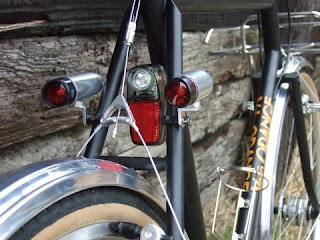 Since low trail geometry is perfect for use with handlebar bag there are braze-ons for a VO rando rack. This keeps the bag within reach, but low enough to ensure that it does not adversely effect handling. We get lots of e-mails thanking us for importing the VO threadless BB. It's saved many a bike with stripped BB threads from the scrapheap. This BB is made for standard 68mm wide BB shells, which is what 95% of bikes have. But what if you have an old mountain bike frame, or one of those odd Raleighs with a wider shell. John-Paul has found a solution which he describes below. And he's posted a photo tutorial. Thanks John-Paul! 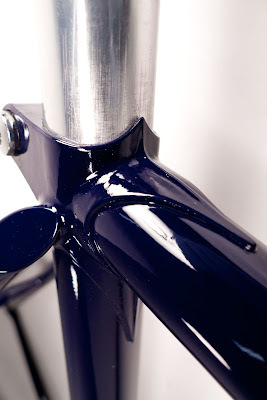 I thought I should send in a report about using the Grand Cru threadless bottom bracket. I own a commuter that is built up around an early-1990s Specialized Rockhopper frame, one that has some damaged threads in its bottom-bracket shell. It had become impossible to turn the pedals with any force without producing a grating creak, no matter how much grease or teflon tape I used when screwing in the bottom bracket. I therefore ordered one of the threadless BBs and tried to install it earlier this week. The first night, I despaired. No matter what I did, I couldn't get the non-drive-side cup to turn onto the cartridge's threads. Eventually I realized that the problem was that the Grand Cru is a 68mm bottom bracket but my model of Rockhopper has an over-sized, 73mm shell. I had decided that that was the end of the road and started pricing new frames. The next day, though, while I was talking to another volunteer mechanic about my problem, he asked me why I didn't just shave a few millimeters off of the bottom-bracket shell. My automatic response was, "Because that would trash the threa...oh." On Saturday therefore I did just that: scribed and ground off 2mm from each side of the BB shell, re-tapped and -faced the shell, and then slipped in the threadless BB. Success! A bike that I was almost certain was a lost cause is now riding smoothly and quietly for the first time in about six months. 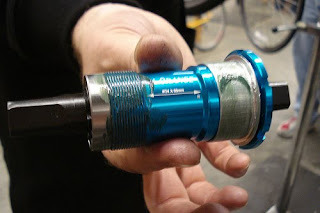 And, if someone has the appropriate tools, they can add those with over-sized BB shells to the list of bikes that they can rescue with this type of bottom bracket. Truly, a great design. We need another person fast, who gets to know our stock and warehouse like it was their own sock drawer. Must read an order correctly, pack a box well, and differentiate a BB shim from a headset spacer. Ability to thrive in chaos with equanimity a plus. Pay isn't great, but it's more than most bike shops offer (you wouldn't relocate across country for this). And we move people up rapidly and are always looking to use any other skills you might have. Employees also get a huge discount, plus free prototype parts to test and keep. Full time. Please e-mail if interested. 50.4 BCD, Like TA, Stronglight 49D, and a dozen other classic cranks. Q-factor around 139mm, among the lowest ever. 46/30 rings making a wide-range double. It has the range of a triple with less shifting and much less weight. 3mm more room between outer ring and crank arm (compared to classic TA) for easier front derailleur setup. Thicker chain rings for less flex than TA or other classic cranks. Shifting pins on chain rings for faster shifts compared to classic rings. Weighs only 550g as shown. Super high polish front and back. We're shooting for June delivery. 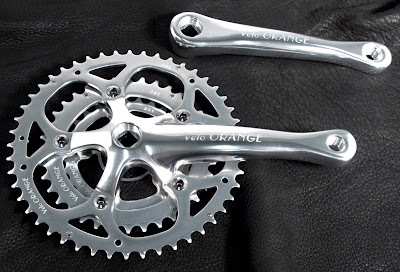 Details on three new 110bcd VO cranks will be posted soon. I'm putting on the finishing touches to Miss Hannah's mixte and will be shipping it off to her in Washington DC sometime next week. I wanted to share with you all what Roger at our local engraving shop--Wyoming Trophy and Engraving--did for Miss Hannah's Velo Orange chainguard. I sent the chainguard and my quote (with apologies to John Keats--I *was* an English major about a thousand years ago ;-) into town with Terry, my partner and Hannah's Mom, and Roger did the rest. Only Heidi, who has a four wheel drive truck, managed to reach Velo Orange today. But the roads seemed to be getting plowed and we plan to be fully staffed and open tomorrow. I think we can get all the Velo Orange orders that came in this week shipped by closing time; sorry for the delay. VO Imports has also had a snow holiday and all those orders should ship on Friday as well. This is now officially the snowiest winter on record, by 11" I think. And more is predicted for Monday. We're going cross country skiing on Saturday. Anyone else doing snow related fun stuff? Four of us braved the icy and unplowed streets and reached VO world headquarters today. Heidi, Annette, and Kyle managed to pack and ship all the orders that came in over the weekend and they're still working on those from Monday and today. But with another snowstorm predicted for tonight we'll almost certainly be closed tomorrow. Poor Tom, who lives about a mile from the Capital building in Washington DC, has still not seen a plow on his street. My street was plowed last night only after I stopped a plow driver and asked. In other news, we now have some very well engineered Porteur double kickstands. If you ride a heavily loaded bike a double leg kickstand is almost essential. We saw the prototypes for this design 11 months ago and were very impressed. We ordered them immediately. 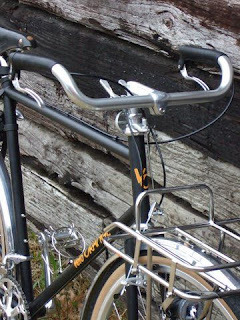 The Porteur kickstands are designed for delivery bikes, city bikes and the like. They are made by a company that manufactures a lot of racks and accessories for Japanese and European city bikes. The neat feature is that the two legs spread as the kickstand is deployed and close as it's raised. This makes for a very stable stand that does not interfere with pedaling. The leg extensions, which look like rubber boots, can be adjusted by twisting and pulling or pushing, so the legs are the perfect length without cutting. An allen wrench can lock them to whatever length you set. There are also adjustments to perfectly align the stand when it's raised. 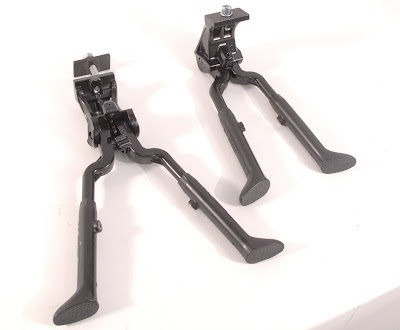 Though these may not be quite as elegant as the Swiss Pletcsher stand that we also stock, they are more adjustable and half the price at $26. Due to the recent snowstorm most of our staff can't make it to work today. So VO is closed. This was one of the heaviest snowfalls, some say the heaviest, on record in our little city. We'd previously had only 13 storms on record that deposited over a foot of snow, but we've had two this year. This one was over two feet and we were simply not prepared for it. My own street hasn't yet been plowed and is impassible even for four wheel drive trucks, though it's fun to watch them try. Many of our downtown streets were built in the days of horse and buggy and are so narrow that they are hard to plow. The sidewalks outside of downtown have not been cleared at all so walking down the busiest road in town to reach VO is hazardous at best, riding would be suicidal. A couple of our staff are stuck in other cities due to canceled flights. And public transport is not running so Perry can't make it in from Baltimore. Tom, who lives in Washington DC, says his street has also not been plowed. What a mess! And there is a winter storm watch for Tuesday night with predictions of up to 20" more snow. I am glad I live in the downtown area where we can walk to restaurants, shops, and pubs. Most of the business owners and staff live close by, so many places are open. With few cars and only locals about, our compact city center has a cozy and convivial feel. What a wonderful argument for building walkable and integrated neighborhoods. I think I'll answer e-mails from home then walk a few blocks, have a long lunch at one of our Irish pubs, and read Jack London over a second pint. Might as well make the best of it. For those of you stuck in un-plowed suburbia I would suggest Kunsler's Geography of Nowhere. Anyone else snowbound? What are you reading? 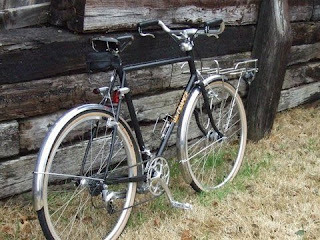 I thought you might be interested in some photos of the Polyvalent build I recently finished up. It's a complete black and silver motif with a combination of old and new components. The bike is intended for commuting, errand running, and social rides. So far, I've really enjoyed the bike. The ride is stable and the low pressure tires really smooth out the bumps. I like these panniers that Kyle found. They are Swiss army surplus and look neat on his prototype Polyvalent. I understand they can sometimes be found at army surplus stores. 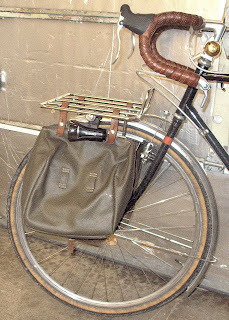 Finally, there is a nice review of the VO Campagne handlebar bag on the Bertin Classic Cycles blog. The rest of the blog is well worth reading too. Check out this, rather dark, photo of a Bertin Porteur Parisian.